All ready to launch and then ... First it was an electrical system in 2017, and now an electrical storm that has caused the delay of ASNARO-2. The Japan Aerospace Exploration Agency (JAXA) said Monday it will postpone the Wednesday launch of its third Epsilon solid-fuel rocket due to expected bad weather, and the threat of a lightening strike. The space agency now aims to launch the three-stage, 26-meter rocket carrying an advanced and low-cost Asnaro-2 radar satellite, from Uchinoura Space Center in the town of Kimotsuki, Kagoshima Prefecture, on Thursday morning, at the earliest. 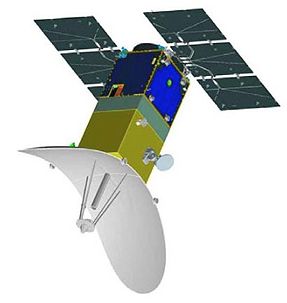 ASNARO 2 (Advanced Satellite with New system Architecture for Observation) is a Japanese radar satellite featuring an X-band radar. The imaging system is a X-band SAR with a ground resolution of 1 meter and a swath width of 10 km. ASNARO-2 was developed by NEC Corporation as part of the project funded by Japanese Ministry of Economy, Trade and Industry. JAXA, NEC Corporation’s contractor is in charge of the ASNARO-2 launch operations. The Epsilon-3 launch, originally scheduled for November 12, 2017, was postponed as its electrical system needed further confirmation. JAXA identified and took countermeasures against the factor that delayed the launch.